Here’s a little background on the celebration (Kepā Maly gave me information from SM Kamakau) and the reasoning why we now celebrate Kamehameha Day on June 11. The 1896 legislature declared it a national holiday. State law notes: §8-5 King Kamehameha celebration commission … “The commission shall have charge of all arrangements for the celebration each year generally observed throughout Hawai‘i Nei on June 11, to commemorate the memory of the great Polynesian Hawaiian warrior and statesman King Kamehameha I, who united the Hawaiian Islands into the Kingdom of Hawai‘i”. Almost from its first observance this day was celebrated chiefly by horse races in Kapi‘olani Park; but the races eventually gave way to today’s parades of floats and pāʻū riders. On February 14, 1883, the Kamehameha statue was unveiled at Aliʻiōlani Hale during the coronation ceremonies for King Kalākaua. The customary draping of the Kamehameha Statue with lei dates back to 1901. 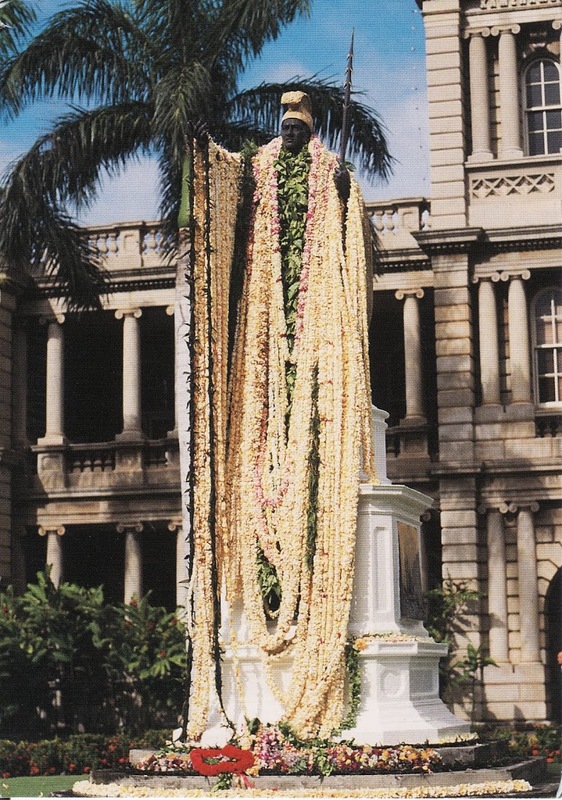 The image shows the lei-draped statue of Kamehameha in Honolulu. In addition, I have included other related images in a folder of like name in the Photos section on my Facebook and Google+ pages.